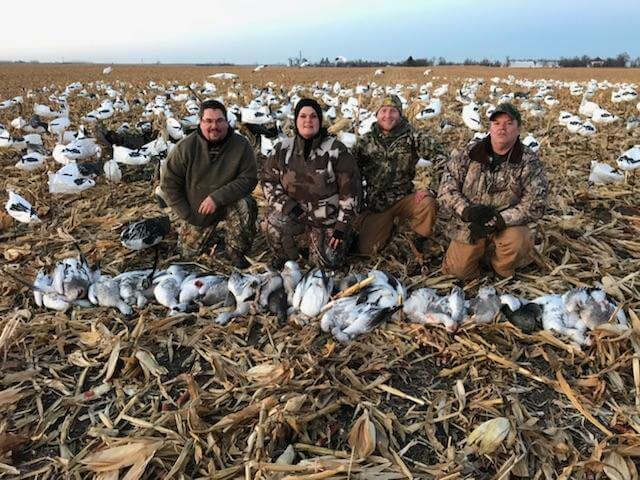 We are booking up very quickly for our 2017 Spring Snow Goose Hunts so if you are planning a trip to South Dakota this spring, please book soon. Big Decoy Spreads, No Limits, No Plugs, and Electronic Calls makes for an outstanding Hunt with Northern Plains Outfitters. We offer various packages to fit anyone’s budget. It’s not too early to book your 2017 Spring Snow Goose Hunt with Northern Plains Outfitters. The best time to hunt Spring Snow Geese is from March 10th to April 10th in South Dakota. We offer day hunts, multiple day hunts, and hunts with lodging and continental breakfast included. We can even add a Pheasant Hunt to your trip, between the morning and afternoon Snow Goose Hunts. Contact us today for details and available dates. Just wanted to drop a quick note to mention we still have a few days available for our Spring Snow Goose Hunts for 2016!! Email us at info@northernplainsoutfitters.com to see what is still available. Well, the leading edge birds were here (Athol, SD) and through 3 or 4 days ago but with the snow, everything has moved back south. I am not sure how far south they went but Mitchell, SD reported 5 inches of snow so they are wherever the snow line is. I look for a good migration starting Friday as temps are supposed to warm up to the 50’s and 60’s by Friday and Saturday. We still have a few days available for this spring so email us for availability at info@northernplainsoutfitters.com. The winter has been an easy one so far which bodes well for our Pheasant and Deer populations. We have about 5 inches of snow on the ground and the temps have been mild, especially for January. The booking season has begun and we are now taking reservations for Spring Snow Goose Hunts, Pheasant Hunts, Archery Deer Hunts, and Buffalo Hunts. We are looking forward to seeing all of our past clients as well as some new ones this fall! In all my years in this business, I have never seen the large amounts of ducks and geese that are nesting in our area. Thanks to large amounts of snow last winter, and alot of rains over the last couple months, we have more “prairie potholes” than ever which equates to a major increase in Duck populations. We are looking for this fall to be spectacular. If you are Waterfowling with us this fall, the deadline is the 13th (online application). Contact me if you have questions. To all of the Waterfowl Hunters, the South Dakota Waterfowl application is due via mail by July 9th. If you are applying online, you have until July 13th to apply for the license. You will apply for the Statewide Tag as your 1st Choice (NRW-00B-86). Your 2nd Choice will be NRW-00Y-86. If there are numerous people in your hunting party, make sure you apply as a group. It will aid in you being successful in the drawing. Things are starting to shape up for this fall. We are booking dates at a fast rate and recommend that if you are thinking of coming out to hunt with us this fall, that you call soon to reserve the dates you desire. Please call Shannon at 605-380-9971 for availability!